Roger Douglas is, in a word, lucky. The Fort Wayne, Indiana, man took his third trip to the Hoosier Lottery claims office Thursday, this time to turn in the grand-prize winning ticket for the Million Dollar Holiday Scratch-off. Douglas has previously won two other major lottery prizes: In 2001, he won $250,000 on a Hoosier Lottery Polar Express Scratch-off, and in 2006, he won $25,000 on a holiday raffle game. "The odds are so against winning in the first place, I never thought it would happen again," said Douglas. "I thought $250,000 win was once-in-a-lifetime. I feel well-blessed." Douglas and his wife, who own their own business, say they plan on saving most of their winnings and have no plans to slow down at work. The Douglases have seven adopted sons who now range in age from 17 to 27. With the exception of one son currently serving in Afghanistan, the couple said they plan to spend the holidays with their sons. 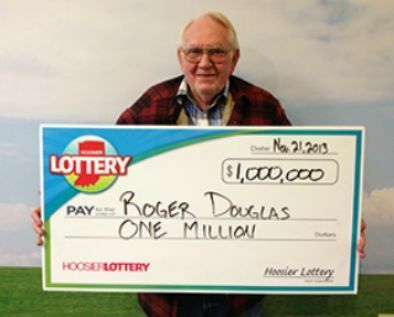 (Click to display full-size in gallery) Roger Douglas with his $1 million winnings.